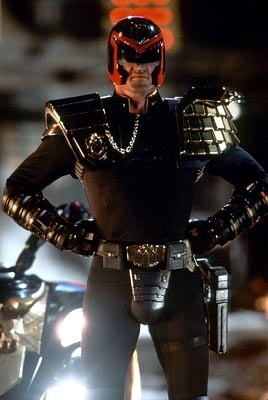 Judge Dredd (1995): This is a great film! It's something different for Sylvester Stallone, and Rob Schneider is FUNNY! I like when he mimics Sly with Dredd's "I am the law!" line. And Diane Lane, who plays Dredd's ally Judge Hershey, is really good and likeable. If you are unfamiliar with this movie, it's based on the comic book character of "Judge Dredd" who is a lawman in the distant future. The premise: all the police officers are called Judges. They are all three branches of the U.S. government rolled into one: judicial, legislative, and executive. The special effects are outstanding, the character concepts are intriguing, and the action is extreme. The villains are especially ruthless.